Skincare is kind of a big deal for us Pore Girls. It makes up about 50% of our conversations on gchat. We spend a lot of time reading about ingredients and sending each other articles. The following is the routine I've been using for about 4 months. It's been working for me in that I don't have crazy break outs but I actually wouldn't call it my holy grail. Acne-prone. This past year has been a hell of cystic acne that I have never had before. They are turning into dark spots and scars because I pick at them (don't pick!). Combination leaning mostly towards oily. I have dry peeling patches around my big blemishes. I also get eczema/roscea type of stuff around my lips and eye creases. Neutrogena Naturals Fresh Cleansing + Makeup Remover - Takes off makeup successfully, it's gentle, has not broke me out, and just really nice product. Lush Fresh Farmacy for nights I feel extra oily or too much product on my face that the first cleanser didn’t get off (This is also my daily morning cleanser). Queen Helene Mint Julep Masque -1-2 times a week depending on skin condition. This is a pretty great mask for the price, but I don't feel like it deep cleans. Lush Grease Lightning on my cheeks and jawline where my acne is concentrated. This is supposed to be a spot treatment, but c'mon, since when do I have "spots"? It's pretty harsh and dries out my skin, but I like it. The Body Shop Tea Tree Oil for white heads and my nose piercing. top it all off with Cerave Moisturizing Lotion on my face and hydrocortisone ointment on my eczema flare ups. On days when I'm too tired or lazy to do all this, I’ll use the Neutrogena cleanser, Grease Lighting, and Cerave (which is most days honestly). This picture is an intense cleaning night. It’s when I feel I need to detox my pores and scrub off all the grossness. I have been experimenting with finding a routine that better fits where my skin is at right now, so I really appreciate this post! Can you tell me more about Lush Fresh Farmacy? How do you like it? Is it harsh? /what other Lush products have you tried and would recommend? Fresh Farmacy is pretty harsh. It leaves that tight squeaky feeling on my face, which some people don't like, but I'm a fan because it makes me feel clean. It's meant to calm skin when it's just all unruly and a hot mess, and I find that it helps me with breakouts and rosacea. I also loooove the scent. I think price wise it's really great because it lasts forever as long as you cut it up in pieces and only use a little at a time, and keep it dry (like any other solid Lush product). Grease Lighting is also harsh, but I think it's helped control breakouts a lot (paired with the fresh farmacy). You don't see results right away, but it gets better. I've also tried Angels on Bare Skin (which smells like Fresh Farmacy). I didn't see much of a result from that, but I think my skin is too problematic for it, it's more for normal skin that just wants a nice normal cleanser. I have 3 bottles of their toner waters, they don't do much, but I like the smells and the feel of them. I have 2 Tea Tree Waters and 1 Breath of Fresh Air. Tea tree water is, again, for acne and troubled skin, and Breath is also to calm it from acting up. I like using it in the morning to freshen up, and after makeup if it looks too cakey. Tea tree water is good for one I lose my picking battles and have damaged my skin, and I want to make sure nothing gets infected (tmi?). And lastly, I've tried their Cosmetic Warrior fresh mask. 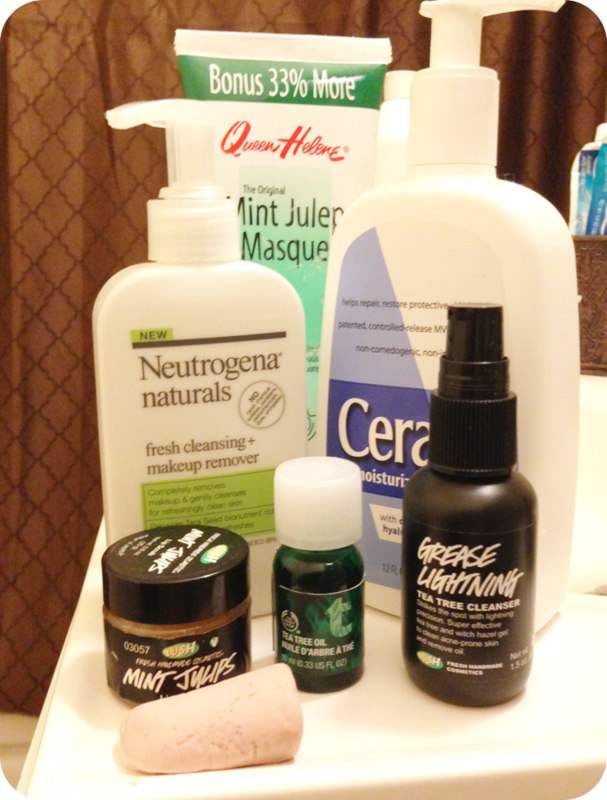 This is, once again!, for troubled, acne prone, oily, skin. It has garlic and tea tree oil along with honey and egg whites. This one does not smell as great. I can stand it, but if you're sensitive to smells, I do not recommend. I liked this a lot. More than the Queen Helene one I mentioned in the post. My pores would feel clean and my skin sooo soft. But that's $6.95 for 2 weeks of use, while Queen Helene is $2.99 for like a year. So yea. Fresh masks are great, but that's a whole diy project waiting to happen actually. But yes, skin care has been my favorite part of Lush so far! We should all go to a store and get samples of everything! omg, this is a long reply. I think I might make it my next post! Thanks for asking! Friends! I want to share about my scar removal, which is successfully done by Klinik Esthetika which is in Delhi, Klinik Esthetika uses the laser technology to remove the scar and there have no pain when this treatment is start. Klinik Esthetika Remove the acne scar very well. Two girls trying to figure out their skintone, one concealer at a time. © Those Pore Girls 2012-2013. Simple theme. Powered by Blogger.